Park Press is definitely the right choice if you are looking for a union political printing resource. We set the standard for long-term customer satisfaction, because we have been exceeding the expectations of discerning political operatives since 1934. That’s right, we have been in the printing business for over 80 years, and the seasoning shows when you see the work that we produce. Many political campaigns rely on the votes of union members and supporters. We are located in Saugus, Massachusetts, and this is especially true in this part of the country. Though we take a great deal of pride in our local roots, we gladly work with union political printing customers in other parts of the country. We make it easy to order online, and we are readily available whenever you need assistance. The team members here at Park Press Printers are proud members of the Communication Workers Of America labor union. Because of this connection, we can place our union logo on the printed materials that we provide for our clients. 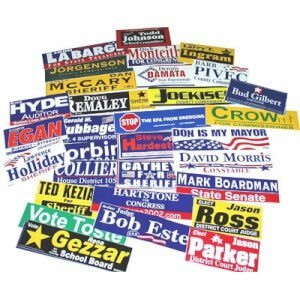 You send a powerful message when you utilize union printed political yard signs, union printed campaign signs, buttons, letterhead, magnets, etc. When you engage us to provide you with union printed campaign signs, union printed political yard signs, and other materials for your campaign, we make things easy. Our design team can work with you to gain an understanding of your vision, and they will come up with a concept. The printing will be done with expert precision, and your order will be delivered right on schedule. Plus, since we have been in business for so long, we have very refined processes, and we get good prices from our suppliers. This gives us the ability to keep our prices low, and this is another benefit that you enjoy when you work with Park Press Printers. We have been able to withstand the test of time because of our firm commitment to the customer experience. All of our team members treat our clients the way that they like to be treated when they are on the other side of the fence. This “golden rule” approach is something that sets us apart from other union political printing resources. If you would like to discuss your needs with a knowledgeable member of our team, we can be reached by phone at 781-233-0315.